Catherine Young grew up liking bugs. Today she's a University of Notre Dame biologist whose area of expertise is medical entomology, the study of insects that cause disease in humans. By contributing to research on major human health threats, she "gets to feel like she's saving the world," says Young, a biologist with the University's Eck Family Institute for Global Health and Infectious Diseases, "but its really just an excuse to play with bugs," she adds with a smile. 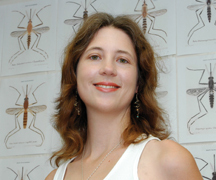 Young researches and admires an insect that's not so popular with the rest of us: the mosquito. "Under a microscope, they're beautiful," she says,"their colors are iridescent and jewel-like." She taught herself to paint in watercolors to illustrate a book on mosquitoes of the region. As a graduate student studying mosquitoes, Young fed them herself literally. She'd put her arm in the cage and let them draw blood. "I've had 300 bites on one patch of forearm," she says. "You get strangely attached to them - they are your own flesh and blood." But in the world outside the laboratory, mosquitoes are vectors carriers of disease, spreading infection by carrying pathogens from one host to another. The disease Young studies is West Nile virus. any kind of bird you ll find at your bird feeder. Crows and blue jays are especially susceptible." "If you see dead crows in the yard in late summer, its a pretty good sign West Nile is present and you need to protect yourself," she adds. West Nile virus takes its name from the West Nile province of Uganda, where the virus was first isolated in 1937. The disease, typically spread by the small, brown Culex mosquito, causes no symptoms in four of five people infected, Young says. One in five of those who are infected will develop what has been termed West Nile fever, an illness with symptoms that include fever, headaches, body aches, swollen lymph nodes and eye pain. But of the one in five who get sick, one in 30 of those will develop a serious and potentially fatal central nervous system disease such as meningitis, encephalitis, or a syndrome similar to polio. "It can be very debilitating," Young adds. "Many are not fully recovered a year later." West Nile Encephalitis has a mortality rate of one in 10, she notes. The risks in St. Joseph County are low; there were three confirmed cases in 2006, none in 2007. Statewide, 2007 Centers for Disease Control statistics show 14 confirmed cases in humans, with one fatality. But the risk varies from year to year; in 2006, Indiana had 80 confirmed cases, with most cases clustered in Lake, Porter and Allen counties. The West Nile-spreading Culex mosquito is only one of several species of mosquito common in the region, Young adds. The Aedes (the black-and-white nuisance biters that come out by the thousands) and Anopheles mosquitoes are not common vectors of West Nile virus, but spread heartworm in animals. You can protect yourself from the virus by protecting yourself from mosquitoes. The mosquitoes that spread West Nile virus tend to bite at sunset and in the early morning, Young says. Wear long sleeves and long pants if possible, and use a good insect repellent. You can also reduce the risk by preventing mosquitoes from breeding around your home and yard. Mosquito larvae can breed in a very small amount of water, even a teaspoon of water in a discarded bottle cap in the yard. "Clean out your gutters, and keep an eye on the birdbath," Young says, adding the fact that breeding mosquitoes takes five days to two weeks. "If you change the water once or twice a week, you should be fine." Originally published by Carol C. Bradley at news.nd.edu on September 01, 2008.